A layer of lightly spiced, creamy Panna Cotta topped with a homemade Raspberry and Beetroot Jelly makes this a simple, but festive dessert. Just perfect for Christmas! 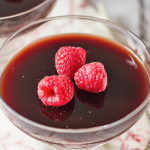 Make the panna cotta: Place gelatine leaves into a small bowl and cover in cold water. Leave to soak. Place milk, cream, vanilla, allspice and sugar into a medium sized saucepan and place over a low-medium heat. Bring to a simmer, stirring occasionally (do NOT boil). Once simmering, remove from the heat. Squeeze water out of the gelatine leaves, then tear into small pieces and add into the cream mixture, mixing slowly as you add in the gelatine. Stir until all the gelatine has dissolved and then divide the mixture between 4 individual dessert glasses. Leave to cool for at least 30 minutes before placing in the fridge to set completely (about 2hrs to be safe). Once set, make the jelly: Place your gelatine leaves into a small bowl and cover with cold water. Leave to soak. Place Raspberry and Beetroot juice and sugar into a medium sized saucepan and place over a low-medium heat. Bring to a boil, stirring occasionally. Boil for 3-5 minutes, the mixture will reduce ever so slightly. Remove from heat, squeeze water out of your gelatine leaves, then tear into small pieces, adding to the juice mix, whilst stirring until the gelatine dissolves. Leave to cool completely, then divide between your 4 dessert bowls, pouring slowly over your panna cotta so as not to pierce it and mess up your layers! Place in the fridge for around 2 hours or until completely set. Serve with fresh raspberries or cream. Panna Cotta's will keep in the fridge, covered, for 2 days.